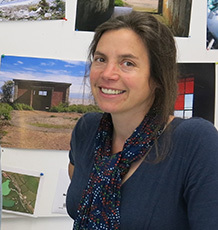 I am a geographer whose research explores the cultural significance of material change and transformation, with a particular focus on heritage contexts. I’ve worked with artists, archaeologists, environmental scientists and heritage practitioners on a range of interdisciplinary projects, supported by funding from UK research councils (AHRC, EPSRC, NERC), the Royal Geographical Society, the Norwegian Research Council and the European Social Fund. I often use visual imagery and story-telling to engage people in imagining changing environments and places, and look to patterns from the past to try to understand what the future might bring. Although much of my research is about how things (and places) fall apart, I am also interested in practices of repair and maintenance that hold things together. I am a member of the Environment and Sustainability Institute and the Centre for Geography, Environment and Society in the College of Life and Environmental Sciences. You can find my Google Scholar account here. DeSilvey CO, Ryan J (2018). Everyday Kintsukuroi: Mending as Making. In Price L, Hawkins H (Eds.) Geographies of Making, Craft and Creativity, London: Routledge, 195-212. DeSilvey C, Bartolini N (2018). Where horses run free? Autonomy, temporality and rewilding in the Côa Valley, Portugal. Transactions of the Institute of British Geographers Full text. DeSilvey CO (2017). 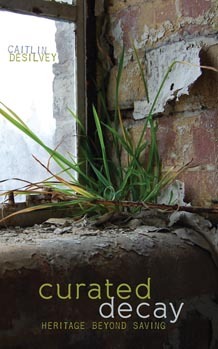 Curated Decay: Heritage Beyond Saving., University of Minnesota Press. Harrison R, Bartolini N, DeSilvey C, Holtorf C, Lyons A, Macdonald S, May S, Morgan J, Penrose S (2016). Heritage Futures. Archaeology International, 19, 68-72. Full text. Nettley A, DeSilvey CO, Anderson K, Caseldine C (2013). Visualising sea-level rise at a coastal heritage site: participatory process and creative communication. Landscape Research, 1-11. This paper describes a research project that aimed to translate complex spatial and scientific data about coastal change into accessible digital formats for general audiences. The project used fine-scale remote sensing techniques including airborne and terrestrial laser scanning to produce spatially accurate and realistic 3D digital visualisations of projected sea level rise at Cotehele Quay, a site on the River Tamar in Cornwall owned and managed by the National Trust. Area residents and stakeholders were involved in a series of focus groups which provided guidance on the integration of the spatial models into a short film. The paper focuses on how the participatory, iterative process adopted in the project shaped the content and design of the film. The paper concludes with a discussion of how this process enhanced the viability of the film as a communication tool for use in wider engagement activities. DeSilvey C (2012). Making sense of transience: an anticipatory history. cultural geographies, 19(1), 31-54. Bond, S, DeSilvey, C, Ryan J (2013). Visible mending: everyday repairs in the South West., Uniform Books. DeSilvey C, Naylor S, Sackett C (2011). Anticipatory history. Axminster, Uniformbooks. Author URL. DeSilvey C (2002). Butterflies and Railroad Ties: a History of a Montana Homestead. Missoula, Montana. Bartolini NLM, DeSilvey C (2019). Recording Loss: film as method and the spirit of Orford Ness. International Journal of Heritage Studies Full text. DeSilvey C (2017). Book Review Forum: Curated Decay, with commentaries by Emma Waterton, Harlan Morehouse, Richard Schein, Tim Cresswell and Caitlin DeSilvey. cultural geographies, 147447401773298-147447401773298. DeSilvey CO (2015). Book Review: Mining Memories: Placing the Anthropocene. Cultural Geographies, 22, 377-378. DeSilvey C, Ryan J, Bond S (2013). 21 Stories. Cultural Geographies, 21(4), 657-672. Casalegno S, Inger R, Desilvey C, Gaston KJ (2013). Spatial covariance between aesthetic value & other ecosystem services. PLoS One, 8(6). Spatial covariance between aesthetic value & other ecosystem services. Mapping the spatial distribution of ecosystem goods and services represents a burgeoning field of research, although how different services covary with one another remains poorly understood. This is particularly true for the covariation of supporting, provisioning and regulating services with cultural services (the non-material benefits people gain from nature). This is largely because of challenges associated with the spatially specific quantification of cultural ecosystem services. We propose an innovative approach for evaluating a cultural service, the perceived aesthetic value of ecosystems, by quantifying geo-tagged digital photographs uploaded to social media resources. Our analysis proceeds from the premise that images will be captured by greater numbers of people in areas that are more highly valued for their aesthetic attributes. This approach was applied in Cornwall, UK, to carry out a spatial analysis of the covariation between ecosystem services: soil carbon stocks, agricultural production, and aesthetic value. Our findings suggest that online geo-tagged images provide an effective metric for mapping a key component of cultural ecosystem services. They also highlight the non-stationarity in the spatial relationships between patterns of ecosystem services. DeSilvey C, Edensor T (2012). Reckoning with ruins. Progress in Human Geography, 37(4), 465-485. DeSilvey C (2010). Memory in motion: soundings from Milltown, Montana. Social and Cultural Geography, 11(5), 491-510. Geographers have begun to investigate the link between creative production and cultural memory-work, exploring how art interventions frame and facilitate engagements with the past in place. This paper builds on this emerging area of enquiry to examine the transformation of an industrial river landscape in Western Montana, and the production of a sound artwork which attempted to respond to the landscape’s unmaking with an interactive installation at a local museum. An interest in how cultural remembrance is practiced and performed in relation to processes of material disarticulation guides the analysis. In conclusion, the paper proposes that a form of kinetic memory characterises engagement with ephemeral sites and the cultural productions they catalyse. The researcher’s involvement in the installation process opens up an adjacent discussion about geographical research conducted on, and through, contemporary art practice. DeSilvey C (2010). River Axe Crossings. J HIST GEOGR, 36(1), 119-119. Author URL. DeSilvey C (2010). The comfort of things. ENVIRON PLANN D, 28(3), 562-563. Author URL. Degen M, DeSilvey C, Rose G (2008). Experiencing visualities in designed urban environments: learning from Milton Keynes. ENVIRON PLANN A, 40(8), 1901-1920. In many discussions of how cities in the global North are changing, the growing importance of urban design is emphasised: that is, the production of visually and spatially coherent urban buildings and spaces seems to be increasingly central to urban change. To date, most attention has focused on exploring the reasons for this shift. Much less attention has been paid to the experiences of the people inhabiting and using such designed spaces. Although many authors acknowledge that, in theory, such encounters between human subjects and designed urban environments are richly various and unpredictable, few studies have examined this empirically and learnt theoretically from these encounters. Drawing on fieldwork undertaken in the British city of Milton Keynes-the centre of which is a shopping mall, a designed environment par excellence-the authors argue that understanding experiences of contemporary urban change requires a relational and performative understanding of environmental encounters, and they suggest three intertwined implications for rethinking research on urban aesthetics: first, a multimodal and sensuously embedded understanding of vision; second, a practice-centred understanding of the environment; and third, a need for self-reflexive understanding of the researchers' position in the fieldwork. DeSilvey C (2007). Art and archive: memory-work on a Montana homestead. Journal of Historical Geography, 33(4), 878-900. DeSilvey C (2007). 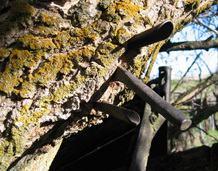 Salvage memory: constellating material histories on a hardscrabble homestead. Cultural Geographies, 14(3), 401-424. DeSilvey C (2006). Observed decay: telling stories with mutable things. Journal of Material Culture, 11(3), 318-338. Author URL. DeSilvey C (2003). Cultivated histories in a Scottish allotment garden. CULT GEOGR, 10(4), 442-468. The historical development of Scottish allotment gardens has invested these urban agricultural landscapes with an ambiguous diversity that persists today in both plot-level practice and in political representations. This paper examines how the ambiguity that pervades allotment practice surfaces as a liability in strategic appeals. I juxtapose a pair of narratives - the story of my involvement in a Scottish Parliament Allotments Inquiry and a history of a single Edinburgh allotment site - to draw out the survival of historical forms in contemporary political negotiations. Although a theory of `tactics' and ` strategies', adopted from Michel de Certeau, frames my discussion, I locate my analysis in the gap between these categories. DeSilvey CO (2019). Head, Hand, Heart: on Contradiction, Contingency and Repair. In Laviolette P, Martinez F (Eds.) Repair, Breakages, Breakthroughs: Ethnographic Responses, Berghan. DeSilvey CO (2019). Rewilding Time in the Vale do Côa. In Tamm M, Olivier L (Eds.) Rethinking Historical Time: New Approaches to Presentism, Bloomsbury Academic. Bartolini N, DeSilvey CO (2019). Rewilding as heritage-making: new natural heritage and renewed memories in Portugal. In de Nardi S, Orange H, Koskinen-Koivisto E, Drozdzewski D, High S (Eds.) Routledge Handbook of Memory and Place. DeSilvey CO (2018). All Change (exhibition catalogue essay). In Cannon L (Ed) Liminal Matter, 3-5. Author URL. DeSilvey CO (2018). The Death of a Lighthouse. In Strang V, Edensor T, Puckering J (Eds.) From the Lighthouse: an Experiment in Interdisciplinarity, Routledge, 157-160. DeSilvey CO (2017). Life after death: palliative curation and future persistence. In Holtorf C, Hogberg A (Eds.) Cultural Heritage and the Future, Routledge. DeSilvey CO (2015). Elemental Analysis. In Raymond-Barker O (Ed) Natural Alchemy, Falmouth, UK: Two Wood Press. Paton D, DeSilvey C (2014). Growing granite: the recombinant geologies of sludge. In Hallam E, Ingold T (Eds.) Making and growing: anthropological studies of organisms and artefacts, Ashgate, 221-238. DeSilvey C (2014). Palliative curation: art and entropy on Orford Ness. In Olsen B, Petursdottir T (Eds.) Ruin Memories: Materialities, Aesthetics and the Archaeology of the Recent Past, Routledge, 79-91. DeSilvey C (2013). Object lessons: from batholith to bookend. In Winders J, Schein RH, Johnson NC (Eds.) Companion to Cultural Geography, Wiley-Blackwell, 146-158. DeSilvey C, Bond S (2013). On salvage photography. In Piccini A, Harrison R, Graves-Brown P (Eds.) Oxford Handbook of the Archaeology of the Contemporary World, Oxford University Press, 642-656. DeSilvey C (2012). Copper places: affective circuitries. In Jones O, Garde-Hansen J (Eds.) Geography and memory: explorations in identity, place and becoming, Palgrave Macmillan, 45-57. DeSilvey CO (2012). Observed decay: telling stories with mutable things (reprint). In Dudley S (Ed) Museum Objects, Routledge. Desilvey CO (2007). Practical remembrance: material and method in a recycled archive. In Gagen E, Lorimer H, Vasudevan A (Eds.) Practicing the Archive: Reflections on Methods and Practice in Historical Geography, London: RGS Historical Geography Research Group Monograph Series, 37-45. DeSilvey C, Yusoff K (2006). 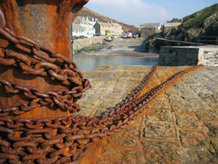 Art and geography: image and interpretation. In Douglas A, Huggett R, Perkins C (Eds.) Companion Encyclopaedia of Geography: from Local to Global, London: Routledge, 571-586. Nettley A, Anderson K, DeSilvey C, Caseldine C (2011). USING TERRESTRIAL LASER SCANNING AND LIDAR DATA FOR PHOTO-REALISTIC VISUALISATION OF CLIMATE IMPACTS AT HERITAGE SITES. Author URL. Nettley A, Anderson K, DeSilvey CO, Caseldine CJ (2011). Using terrestrial laser scanning and LiDAR data for photo-realistic visualisation of climate impacts at heritage sites. 4th ISPRS International Workshop 3D-ARCH 2011 “3D Virtual Reconstruction and Visualization of Complex Architectures”. 2nd - 5th Mar 2011. (2014). Work Package 5: Cultural Ecosystem Services and Indicators. DEFRA. Desilvey CO (2006). Coloma, Montana: Cultural Resource Management Plan. Bureau of Land Management, Missoula: BLM Missoula Field Office. Desilvey CO (2006). Update to the Joint Northside/Westside Neighborhood Plan. Missoula City/County Office of Planning and Grants, Missoula, Montana. DeSilvey CO (2017). The Art of Losing. Web link. DeSilvey C, Ryan J, Bond S (2012). A Celebration of Repair. Author URL. Web link. DeSilvey C (2008). 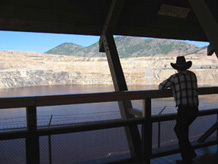 Watershed moment: the death of a Montana dam, Slate Magazine. Author URL. DeSilvey C (2006). Dammed memories: a Montana river, transformed, Slate Magazine. Author URL. DeSilvey C (2005). Rot in peace: putting old buildings and settlements to rest, Slate Magazine. Author URL. DeSilvey CO (2017). Mud. Uniformannual(2018), 90-91. Author URL. DeSilvey CO (2017). When Loss is More. Views(54), 76-77. Author URL. Finlay A (2007). two fields of wheat seeded with a poppy-poem. Author URL. DeSilvey CO (2004). A Landscape Event. Verse Chain Author URL.